Anyone who has been following the cryptocurrency scene already knows how lively the discussion is on Twitter. We wanted to have a bit of a look at the relations between the different parts of the community so we turned to some basic social network analysis. We took a look at who “liked” whose tweets, and ran algorithms meant to find the social groups in the graphs. 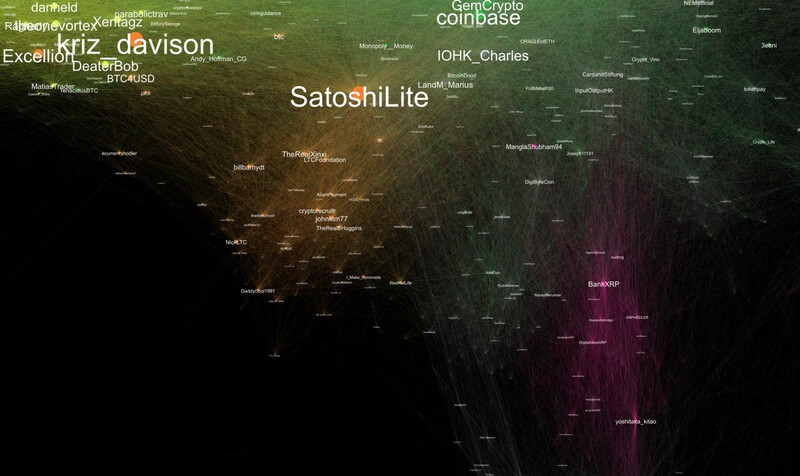 The map that we get very clearly shows the social relations between various sub-communities as you’d expect if you’re following the cryptocurrency scene (for example, Bitcoin cash and Bitcoin Core are not very friendly towards each other). Disclaimer: We do not really cover the entire space. See below how we generated our maps and collected data. Data was collected over a short period of time and may not fully reflect the social interactions over longer periods. Here’s the map in all its glory (click here or on the pic for a full sized version). 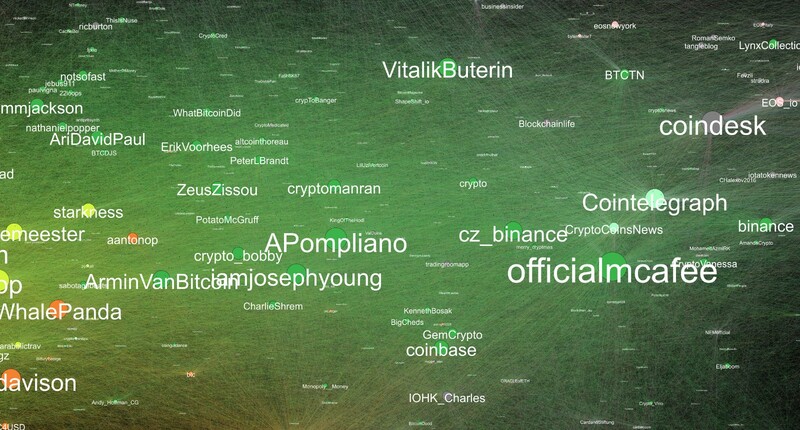 Accounts related to cryptocurrencies. Edges represent “likes” of tweets. 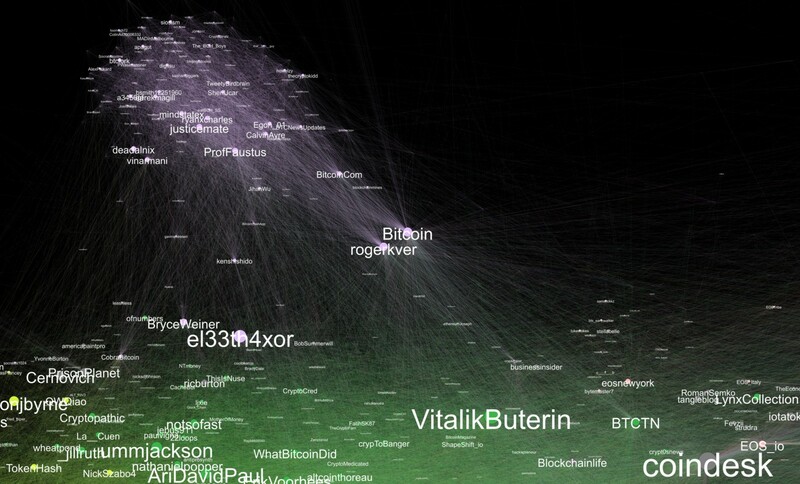 The lime-colored area is one that roughly matches “Bitcoin Core”. 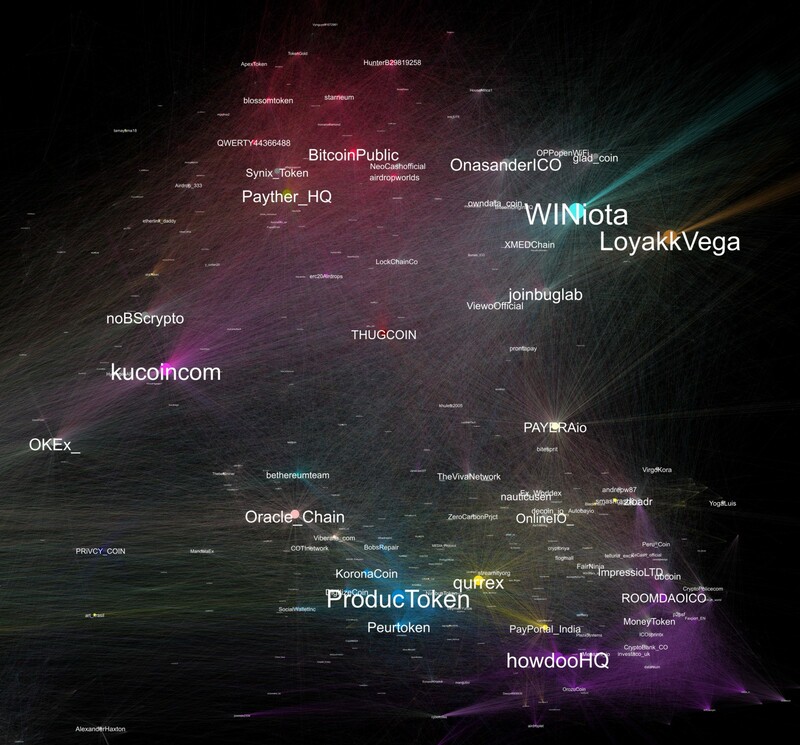 Another large and interesting cluster contains some blockchain influencers like Mcafee, Vitalik, Eric Voorhees, Jackson Palmer, etc. It’s also related to some exchanges like Coinbase, Binance. 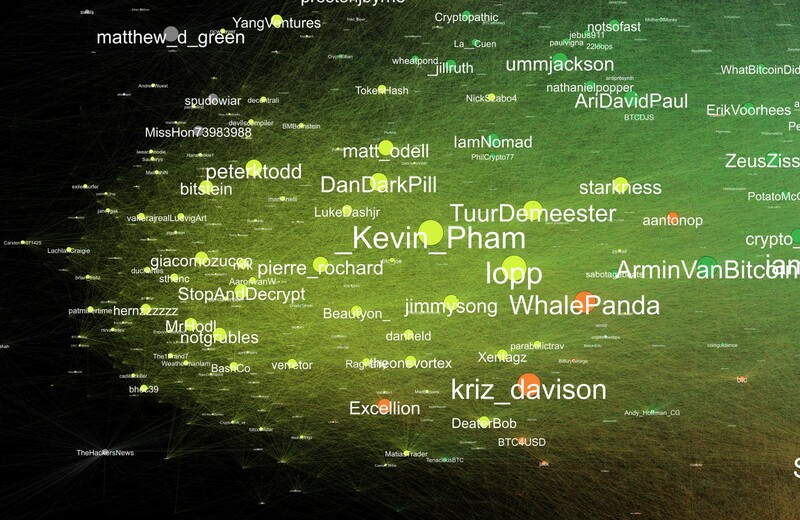 This cluster is well connected to the “core” cluster, and some people somewhat midway between the clusters include Elizabeth Stark, Andreas Antonopoulos, Tuur Demeester and other well known names in the community. The Lavender cluster is clearly “Bitcoin Cash” related, as it features Roger Ver, Bitcoin.com and @Bitcoin that are accounts known for supporting Bitcoin Cash. Finally, you can see a host of assorted blockchain projects and systems that are in different clusters that are mostly “far” from the main group. 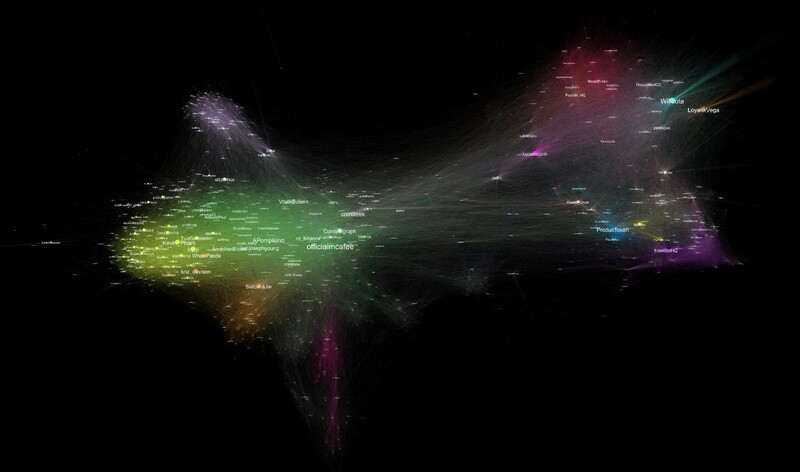 They generate quite a few tweets, but seldom interact with accounts in the other clusters. The search returns a bunch of original tweets, replies, and retweets. Of those we kept anything that had at least 100 retweets or 100 likes, and kept a list of the users. This gave a list of 29,082 unique Twitter users. For each user, we collected their 200 recent likes, and 2500 tweets (including replies). To cluster the graph into sub-communities, we created a graph in which the weight of the edge from user A to user B is the number of times that A liked one of B’s tweets. We then ran Markov-Clustering (expansion=3, inflation=3.7) to get the clustering you see in the image above. The image itself was generated using Gephi. The size of nodes reflects their PageRank score. Names of accounts that had low PageRank were not displayed. You may have noticed that we did not mention the Ethereum community. Does a clear group exist? Where is it on the graph? Does it have a low presence on Twitter? or did it mix in with the other groups? Let us know if you found any of this interesting. We’d love to get some of your comments.